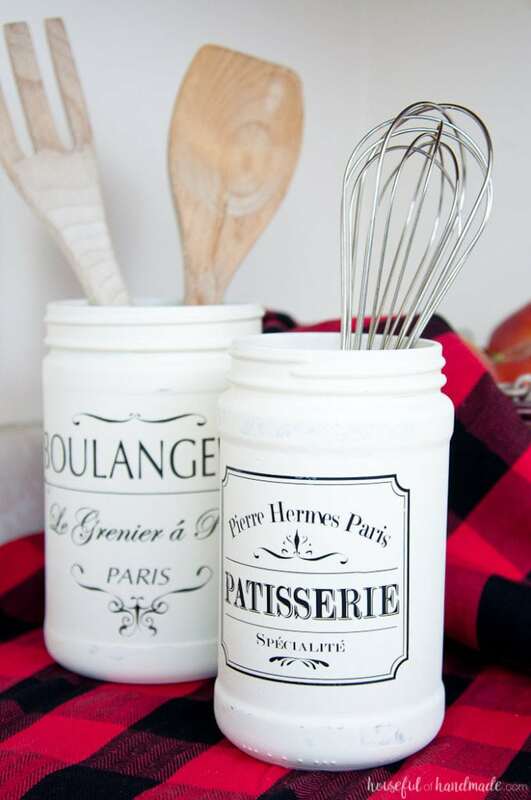 These upcycled jar crafts are a great way to repurpose glass jars! As regular readers know, I’m a huge fan of saving and upcyling glass jars! 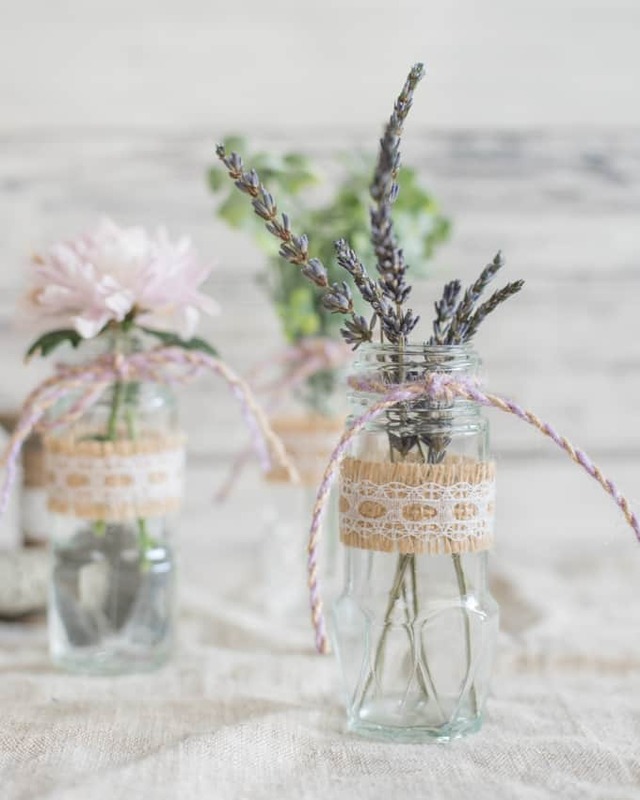 Upcycled jar crafts are a real win-win because you get to use free craft supplies and there are so many cute jar craft ideas. Virtually every mason jar craft idea can be made with a recycled jar, instead, but since there are plenty of mason jar craft roundups out there I’m focusing on projects that specifically use upcycled jars and bottles in the tutorials. As always with craft roundups, I’ve tried hard to find less common ideas to share with y’all. We’ve all seen the chalkboard labels on recycled jars and using jars to hold our Q-tips. They are perfectly good, useful ideas, but I’ve worked to find (mostly) less common upcycled jar crafts for today’s post! I really hope you enjoy. These Upcycled Spice Jar Bud Vases from yours truly are one of my favorite recycled jar crafts I’ve shared. I haven’t seen many other recycled spice jar craft ideas, so I like that it’s unique! Why buy milk bottles when you can have coffee and a milk bottle for “free” as a bonus? 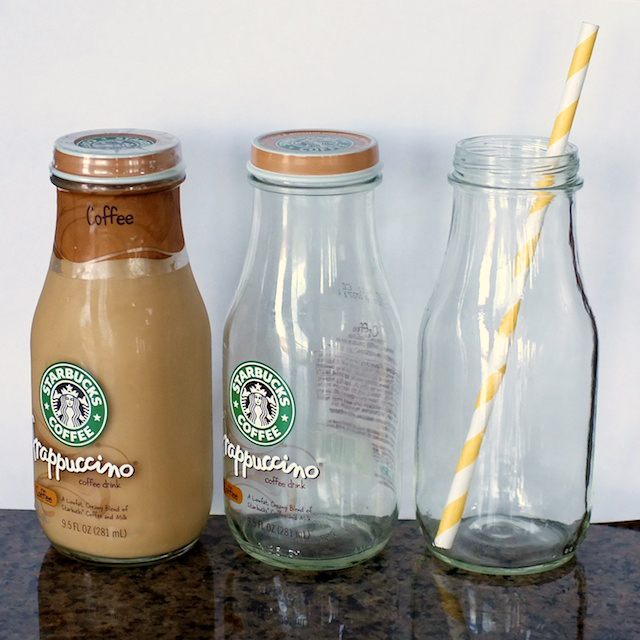 This post on DIY Glass Milk Bottles from House of Decorating explains how to easily get labels off frappuccino bottles for a party or crafting purposes! Once you have some nice, clean milk bottles that are ready to use, why not use them to Make Sea Glass Bottles with Silver Pennies? And now that you have frosted bottles, why not follow this Lettered Vase Centerpiece DIY from Minted? 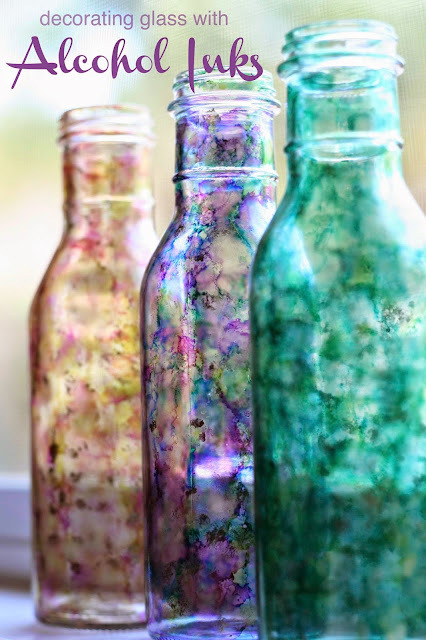 These bottles decorated with alcohol inks from Bliss Bloom Blog are another great way to decorate your upcycled jars! You’d never guess from the photo that this Farmhouse Kitchen Canister DIY from a Houseful of Handmade uses upcycled jars! 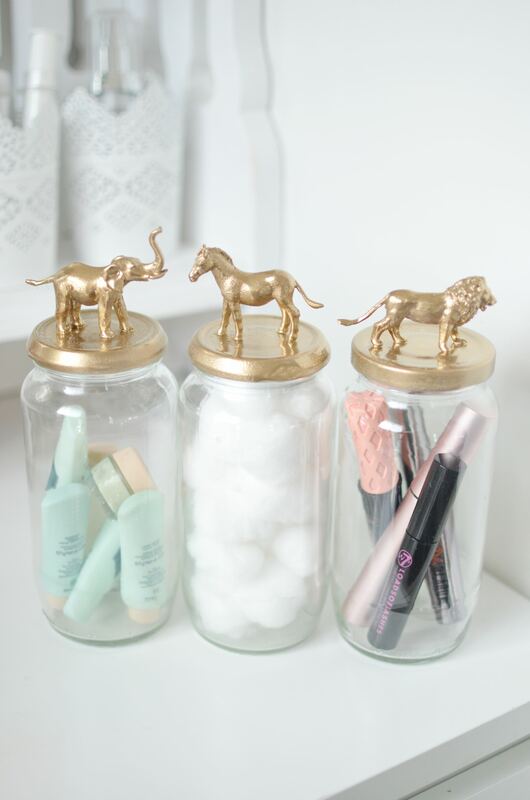 There are several variants on the theme of critter topped storage jars, but these Gold Animal Jars from Bang on Style are probably my favorite. 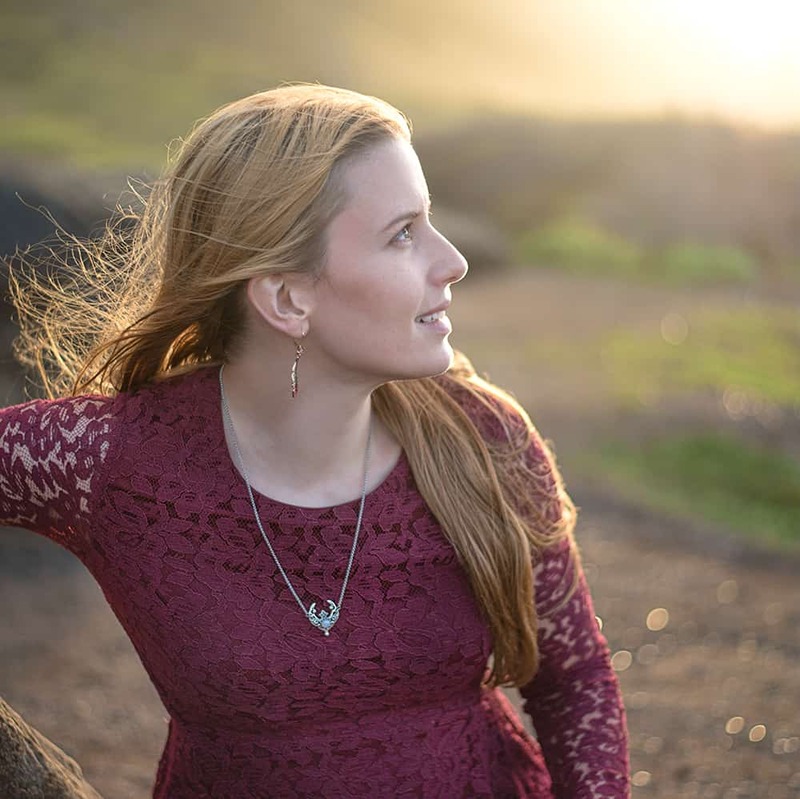 I mean, there’s bokeh in the background of the tutorial pictures! How can I not like it? These Recycled jar harvest terrariums from 365 Days of Crafts contributor Niki are so cute! She went with a fall theme, but you could easily make something similar for any season. These Primitive Apothecary Jars from A Diamond in the Stuff are also super cute for any season! 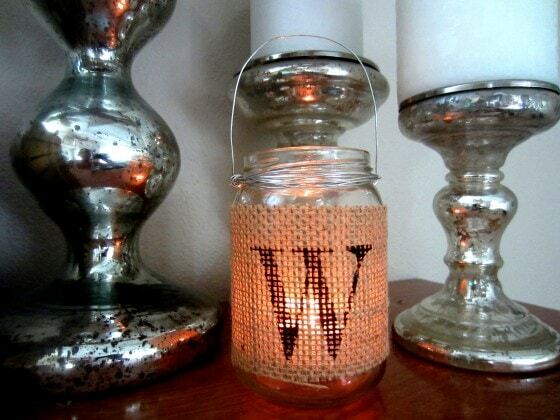 These Recycled Jar Tea Lights from DIY Inspired are yet another cute thing to use your old glass jars for! 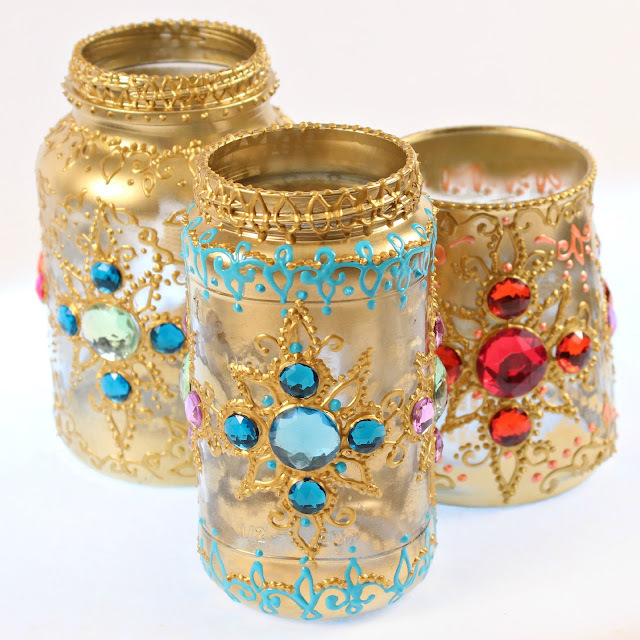 For a more bedazzled lantern, check out this Bejeweled Jar Lantern DIY from Make your Mark! You can also use recycled jars to feed your flying friends! 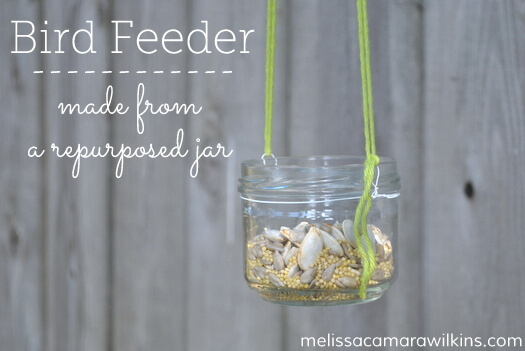 This DIY bird or butterfly feeder from Melissa Camara Wilkins is a fantastic way to put a repurposed jar to great use! 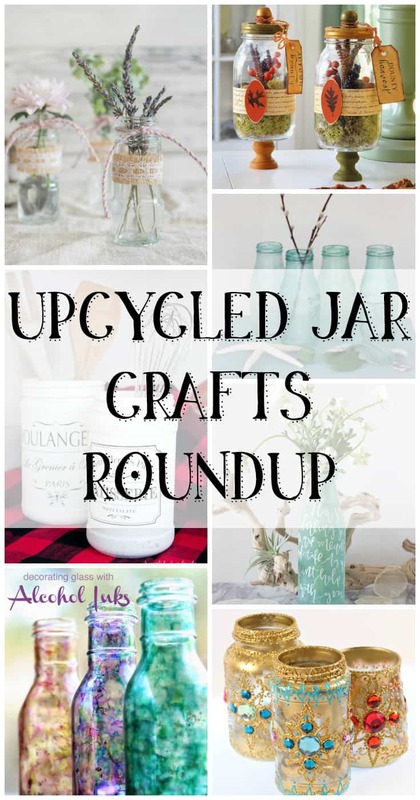 I hope you enjoyed this roundup of less common upcycled jar crafts and that you are inspired to make something with a recycled jar soon! Please note – all photos are property of their respective owners/posters. 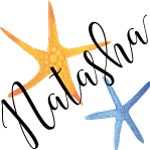 These are such fantastic ideas Natasha! I have tons of jars I use for storage, and some of these ideas would be awesome to label and display in the kitchen!! Thank you! There are lots of neat old jars at our place in WV – I wish we could bring some of them back with us, but I’m afraid they wouldn’t make it intact!